OK. WTC7 collapsed on the afternoon of 9/11. the FEMA report suggests that the building fell from fires, but does not come to any specific conclusion. WTC7 has never since been mentioned by almost any media, and is not mentioned a single time in the 911 'independent' investigation. WTC7 is a major smoking gun of 9/11. you should research it and understand what caused it to fall, and why 'they' would want it to fall. 1) no steel based structure has ever fallen due to fire. you can verify this in fire engineering monthly, do some research on the editor in cheif of that magazine who is adamant that the gov't prevented a real investigation. on 9/11 three steel buildings collapsed 'from fire', 2 were hit by planes, 1 was barely hit by any debris, that building was building 7 (WTC7).. sure there was some debris damage, but nothing like WTC6 and WTC5 and other buildings much closer. Research 9/11 and this administration! 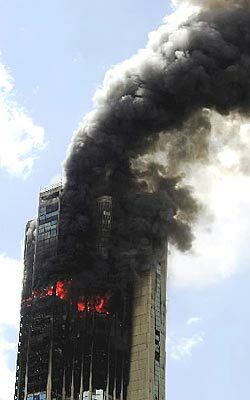 a huge fire occurred today in caracas venezuela.. it gutted 16 floors and reached 26 floors total.. the fire burned for 17 hours but the 56 floor building remained standing. compare this to building 7 which was reported on fire around 4:05pm and collapsed around 5:30.. and had minor fires, but collapsed into dust. on a side note, i have a dvd copy of 'Painful Questions', according to their copyrights i can make as many copies as i want as long as i dont make a profit from them.. so if anyone would like a copy please let me know, i would be more than happy to drop anyone off a copy. if you really want to know the truth about 9/11 start doing some research.. one of the major smoking guns regarding 9/11 is WTC7. if you do some research into WTC7, comments made by Silverstein, how long it took the building to fall, 'the law of falling bodies' by galileo, etc. etc. research WTC7, we should demand more answers. if minor fire can destroy WTC7 (not hit by plane, not hit by major debris, look at the pictures/videos) then why do explosive companies exist? if i could set a fire on 2-3 floors only in the center of a buidling, and have it collapse into the footprint of the building into tiny pieces ready for removal, then why dont we do demolition work with fire? beleiving there isnt a cover up on WTC7 requires an ignorance on the subject..
"Half of New Yorkers Believe US Leaders Had Foreknowledge of Impending 9-11 Attacks and â€œConsciously Failedâ€ To Act; 66% Call For New Probe of Unanswered Questions by Congress or New Yorkâ€™s Attorney General, New Zogby International Poll Reveals"
zogby is referrenced alot in political polls, but for some reason the only mention i could even find of this poll in the mainstream media was in an article by the washington post which you can find here. i started researching 9/11 around july 1st of this year.. as of today that makes almost 3 months of research i have put into 9/11.. at this point all of my research has led me to a beleif that most americans would write off in a heart beat, but anyone who does the research will reach the same opinion.. if you think im wrong, then take a moment and ask how much you really know about 9/11. i beleive the bush administration intentionally allowed 9/11 to occur, and should be investigated by a truely independent 9/11 commission. 9/11 was a catalyst, much like pearl harbor, to bring america together to fight the war on terror. i know that what i say is inconceivable to the average american, but i beleive i can virtually prove it. I want to take a second to suggest that everyone take a second to think about 9/11. We all said we would never forget, stay true to that, keep an eye on what is being said about 9/11, what is happening because of it. Take a moment every once and a while and go to google's news site and search for 9/11..